I love this recipe so much because it is easy, quick, and so tasty. It is simple enough for a night on the couch catching up on shows, but the stunning presentation also makes it a great choice for entertaining guests. Use real, quality maple syrup – it makes such a big difference. Preheat oven to high broiler setting. Slice grapefruit in half. Remove seeds. Prepare fruit by running a paring knife between each citrus section to loosen the fruit from the skin and membrane. 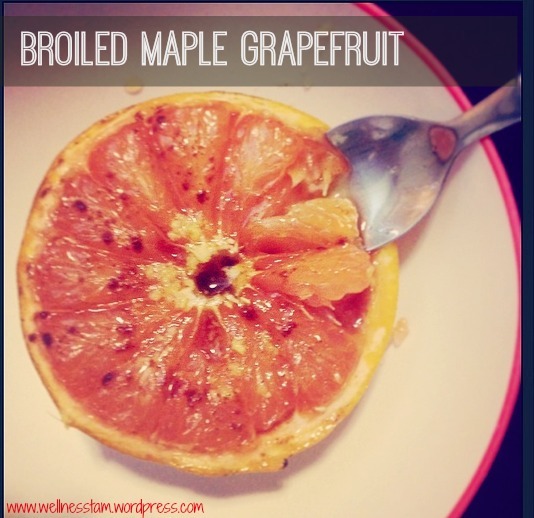 Place each grapefruit half cut side up on a foil lined baking sheet. Drizzle with maple syrup, grated fresh ginger, and a sprinkle of cinnamon. Broil for 3 to 5 minutes, watching carefully so they do not burn. Remove from oven and allow to cool for 1-2 minutes. Serve warm.